Individual & Group Power Coaching Corporate Programs. Discover solutions to issues in all 7 areas of your life. 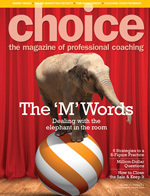 By now you probably know that CLI has developed award-winning tools called Power Coaching® with Mind-Kinetics®. Indeed we offer individuals certifications to become a Certified Power Coach®, Professional Power Coach®, Group Power Coach® and so on. We have a saying "You have to experience it to believe it!" And this is true. Our Clients tell us that we offer a 'Master' or 'PhD' level of coaching. Indeed, one of our Certified Power Coaches works on a team of 100 other coaches. She is the only Power Coach on the team and her manager tells her that she is the best of them all because of the depth of her training and, more importantly, the whole-brain tools she offers in her toolkit. We trust that this sharing will provide you with a trust factor in hiring our certified practitioners. Our certified Power Coaches learn universal tools. Therefore, you may be a CEO of an organization who wishes coaching on leadership issues as well as family challenges. Certified Power Coaches have the tools to assist you in discovering solutions to issues in all 7 areas of your life. The results are astounding. Check out "Success Stories" or you may wish to move directly to Find a Coach. Do you remember when people in organizations were too shy or too scared to share their ideas? Perhaps you still employ some of those individuals. Group Power Coaching brings out the best in everyone. It allows the quiet ones to speak and the domineering ones to share the platform. Group Power Coaching plows through a group's challenges in just a few hours versus the days or even weeks that used to be required. You truly have to experience this process to believe it.